Melissa Shea in Dugla Pass, overlooking the valley, Himalayas, Nepal. NEW VINEYARD — Melissa Shea was born in Strong and now lives in New Vineyard. She grew up in the New Portland/Kingfield area. After graduating from Carrabec High School in 1996, she went on to Colby College in Waterville to earn her B.A. in government in 2000. Melissa missed her college graduation. She was in Alaska climbing Denali, the tallest mountain in North America (20,310 feet); third highest of the Seven Summits, the highest mountains on each of the seven continents. Denali was her very first “big mountain trip.” She was 21. She and her friend, Jim Albert, also of New Vineyard, were raising money for Make-A-Wish Foundation of Canada. The Royal Canadian Mounted Police (RCMP) were sponsoring their four-week expedition. She and Jim went at the invitation of his friend, Manny, a Mountie himself, who requested their assistance on this climb because of their greater experience with winter mountaineering, including ascents of Mount Washington and Katahdin. That might be the understatement of the year. “A lot more” includes the Himalayas in Nepal, Mount Blanc in France, the Matterhorn in the Alps, and Kilimanjaro in Africa. “Mom took us hiking when we were kids,” Melissa said, remembering the time they hiked Bald Mountain in Rangeley. She was about 7. “I brought three My Little Ponies and my blanket,” she recalled with a grin. The Bigelows were another favorite family climb and there was “a lot of camping,” too. In 1997-98, Melissa was working at Longfellow’s Restaurant in Kingfield, a job she’d started in high school. Her co-worker, Kelly Nutt, suggested Melissa join her for a climb at Angel Falls in Rangeley. Kelly introduced Melissa to her husband, Jim, their guide for Melissa’s initiation into more challenging terrain. In 2009, Melissa joined the Mountain Guide Service as Jim’s business partner. Though Jim retired several years ago, Melissa continues to operate the business. In preparation for Denali, aka Mt. McKinley for about a hundred years, Jim and Melissa spent a week at “Manny the Mountie’s” home in British Columbia, where they also “bonded” with the rest of the Denali group in an authentic native Canadian sweat lodge. Manny and Jim had met in Argentina at Aconcagua, the tallest mountain in the Americas, another of the Seven Summits. Manny was having trouble with his boots; something just wasn’t right with them. Jim, who had climbed the mountain hours before, gave his boots to Manny, enabling him to make the climb. Following the Denali climb, Melissa and Kodiak, her Alaskan husky (purchased in Maine from Barry Dana, former head of the Penobscot Nation), moved to Alaska. She bought a little car for $1000 and traveled around the state for eight months. The biggest fish she ever caught? A 40-pound king salmon – on her fly rod. She didn’t stay long. After earning her Wilderness EMT certification, she moved to Colorado. She taught avalanche rescue and worked for a German company that manufactured avalanche equipment. Covering territories in New Mexico, Wyoming, southern Colorado, Montana and Alaska, Melissa met with the company’s various accounts, including ski patrols, ski mountains and retailers, to instruct clients on the proper use of equipment such as the avalanche transceiver. This device could be used to signal for help or to locate the one needing assistance. In 2003, Melissa’s climbing went international. She flew with Jim, Kelly and a few others from the Farmington/New Portland area to Tanzania and met the guide who would lead them on a five-day climb to the summit of Kilimanjaro, a dormant volcano and Africa’s highest peak (19,341 feet). At dawn of the fourth day, they summited just in time to witness “the most spectacular sunrise ever” and take in the view spreading hundreds and hundreds of miles. Following that feat, on to France for an even more “technical” climb up Mount Blanc (15,700 feet), the highest mountain in the Alps. No tourists on this climb. Lightning, rain and snow. No visibility. Dangerous. However, having studied the route, the group was successful in reaching the hut located within 2000 feet of the summit. At that point, the treacherous conditions forced them to call a halt. Good choice. While they were there, a man was struck by lightning when going to the bathroom. Melissa’s first trip to Nepal was in 2011. 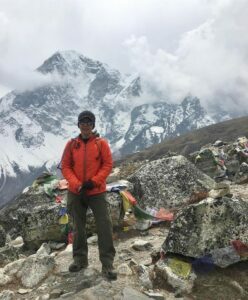 She and Jim were leading their first international adventure, taking 12 clients up to Mount Everest Base Camp on the highest mountain on earth. Manny the Mountie brought six clients from Canada. Four others were Americans. Two people from Belgium completed the dozen, who ranged in age from 17 to 72. The climbers met their Sherpa guides in Lukla. This particular Sherpa family lived above 10,000 feet, “a pretty hard life, subsistence living.” Jim, who had climbed Everest in the ’90s, introduced his group to Samden and his wife, also Samden, “very sweet people.” Their two sons were destined for America, to Maine to be exact, to attend high school at Fryeburg Academy. Both have since graduated from college. Having become acquainted with them in Nepal, Jim, Kelly, and Melissa were able to “keep an eye on them” while they were here. They stayed in Kathmandu, “in a beautiful home in the suburbs. We weren’t near any of the touristy spots, in a real village, with real people and real shops. It was a totally different experience, a pleasure trip, not business. “We still had to tell somebody they couldn’t (summit). You’re just not always able to do what you think you can do, physically … If you train you can do most anything … can’t expect to without it. Their third trip to Nepal next year is in the planning stage. Between work-related travel and mountaineering adventures, Melissa visited Mom in Maine one Christmas. While skiing with Jim around his place, she noticed a sign for some property for sale. The realtor never showed up for their appointment, so she called the owner. When their contract expired, Melissa made an offer and bought 45 acres just a quarter-mile from the Alberts’ home in New Vineyard. She’s been there ever since. The property was basically just woods, which required Melissa to “start from scratch.” She built a driveway and a house, cleared the land, dug a well … The Mountain Farm was born. 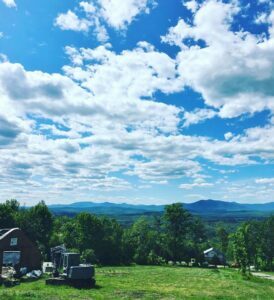 Her home, which Melissa describes as “really cute with a beautiful view from Mount Blue to Bigelow,” is completely off the grid, powered by wind and solar. She has no mortgage and no debt, which prompted her to share a little life lesson. In 2013, Melissa was certified through Maine Organic Farmers and Gardeners Association (MOFGA). This was “quite a process … a lot of paperwork, a lot of record-keeping,” but well worth the effort. In 2016, she was named Conservation Farmer of the Year by the Franklin County Soil and Water Conservation District. Her organic farm specializes in fresh vegetables, herbs, hops, honey, maple syrup and natural salves made from arnica, a flower which she also grows herself. Since she’s been back in Maine, Melissa has become involved in Franklin Search and Rescue (FSAR). A member for seven or eight years, she now also serves on the organization’s board. Her most recent medical certification is Wilderness First Responder, one of the higher levels of education for dealing with many different conditions in the “backcountry,” a location at least two hours from a hospital. During her “many years” in Colorado, Melissa and Kodiak adopted a Siberian husky, Burt, from a local rescue shelter. With two dogs in the family, Melissa’s next move was to purchase a dog sled and learn to mush. Her interest in dogs led her to work with MESARD (Maine Search and Rescue Dogs). Though both Kodiak and Burt are gone now, Melissa joined this team about six years ago. Interestingly, MESARD teams get sent out more often than FSAR, 30 times a year. They work statewide. Typically, a rescue team includes five to eight dogs and five navigators. Also called flankers, navigators lay out a very precise grid using GPS and monitor the dogs to make sure the entire area, sometimes “miles and miles and miles,” is meticulously covered. “My teammates have found a lot of people,” Melissa stated. MESARD has about 39 members, predominantly women. Though most of the SARs in Maine have more male members, there is one other team, a horse team, that is primarily women. For example, there are only three or four women on the FSAR team. “And because that wasn’t enough search and rescue work,” she continued, “I took over the rope rescue team leader position (for FSAR),” putting her in charge of trainings and making her the “incident leader,” organizing the team in response to a call. Additionally, Melissa serves on the board of MASAR (Maine Association of Search and Rescue), the oversight organization for all of Maine’s SARs. Melissa recently attended the annual Baxter State Park Winter Mountaineering Workshop. One evening, she gave a presentation about her adventures in Nepal. The following night, the presenter was a Maine guide who had lost all his fingers while attempting to summit Everest in the ’80s. In between their two trips, in 2015, a major earthquake had caused a lot of damage that had not been repaired. “It was interesting to compare our photos,” she noted. Back to Mountain Farm, Melissa recently purchased more property along Route 27. Future plans include building a farm stand, to be run on the honesty system. She’ll complete the site work herself with her own tractor and excavator. She’s also planning to construct another domicile on her mountain property. “Value the things you have,” she urges. A lifelong learner for sure, Melissa belongs to five different libraries and makes good use of the interlibrary loan system. Her current adventure in education is earning her real estate license. Having recently passed her first test, she just has one more to go.